Chinese Phonetics is suitable for the pre-beginners, who start the Chinese learning from the first initial and final. The course focuses on the detailed explanation of phonetic essentials such as consonants, vowels, tones, the rules of phonetic combination and tone shift. The progressive learning approach coupled with intensive training focusing on pronunciation and listening will ensure you first class results. Learn the basic pronunciation rules of the Chinese language. 16 sets of relevant exercises. 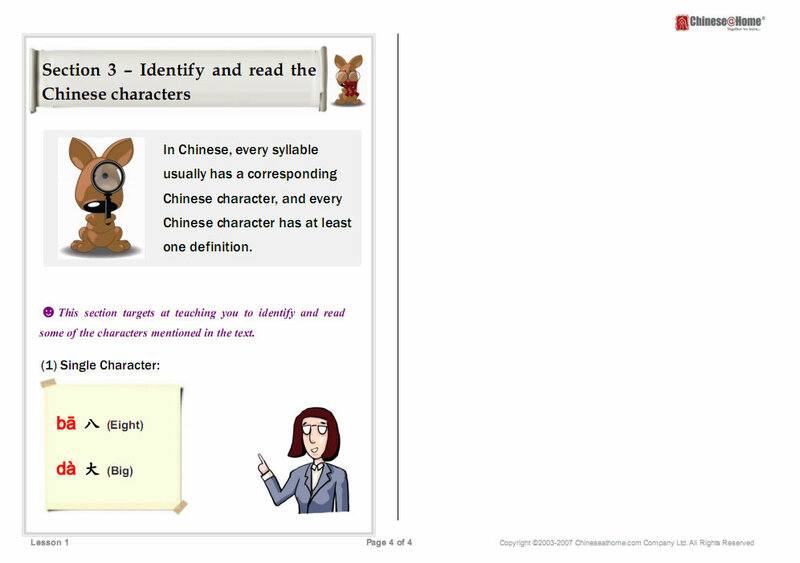 With both Chinese and English version study materials. Lesson 1: Basic knowledge of Chinese pronunciation, such as initial consonants, single final consonants, vowel a, o, e, intonations, etc. Lesson 2: Initial Consonants d, t, n, l; Single Final Consonants i, u, ü, and neutral intonation. Lesson 3: Initial Consonants g, k, h, final consonants i, ei, ao, ou, and the Orthographic Rules of them. Lesson 4: Intonation Variation: transposition of 3rd tone, and half-tone. 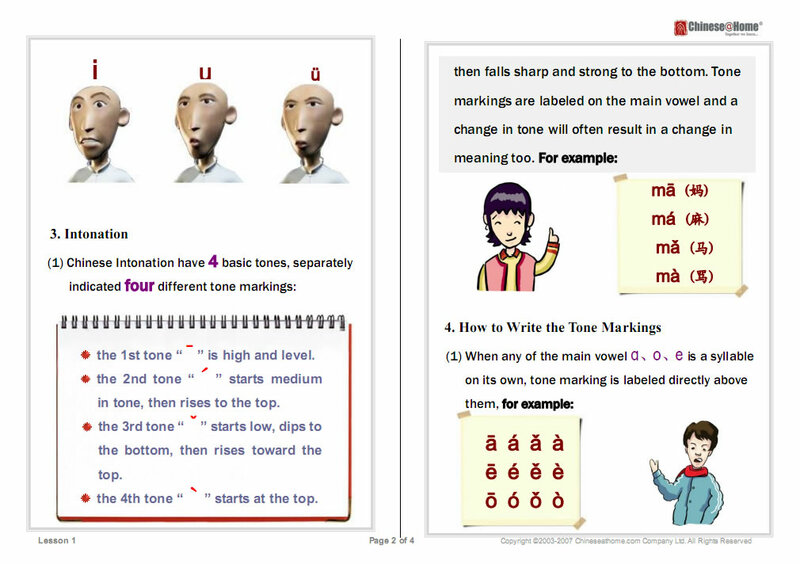 Lesson 5: Initial consonants j, q, x and final consonants ia, ie, iao, iou（-iu）and their orthographic rules. Lesson 6: Initial consonants j, q, x, final consonants ian, in, iang, ing, iong and their orthographic rules. Lesson 7: Initial consonants zh, ch, final consonant - i, and compound final consonants an, en and their combination rules. 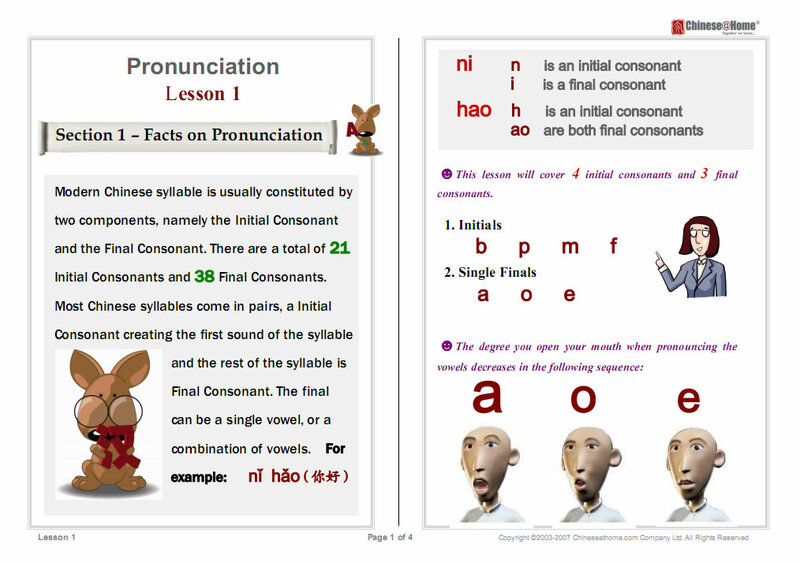 Lesson 8: Initial consonants sh, r, compound final consonants ang, eng, ong and their combination rules. Lesson 9: Initial consonants z, c, s, compound final consonants ua, uo uai, uei(-ui). 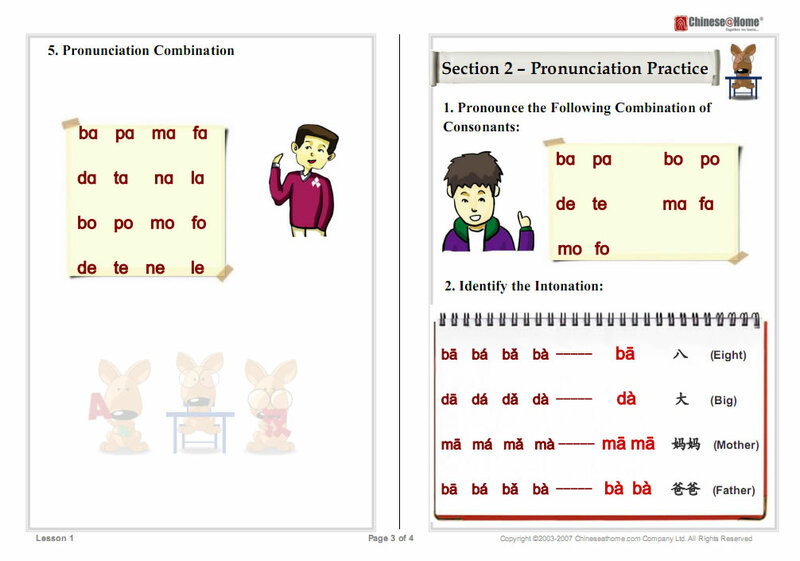 Lesson 10: Review z, c, s, compound final consonants uɑn, uen(-un), uang, ueng.